Some 50,000 cubic meters of water per hour began to pour into the Panama Canal’s new Atlantic locks earlier this month, a sign that the massive project to expand the waterway is reaching its final stages. 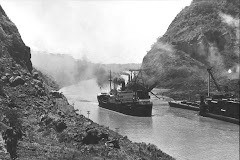 It took five days to fill the Atlantic locks, and then the Panama Canal Authority began pumping water into the chambers of the 11-story locks on the Pacific side of the canal in preparation for about four months of tests and inspections. It’s even chartering a ship so canal pilots will be able to get some real-life training on the new locks. “Filling the locks with water is the culmination of arduous years of labor and the realization that we are within arm’s reach of completion of one of the most impressive infrastructure projects of our time,” said Jorge L. Quijano, chief executive and administrator of the canal authority. The $5.25 billion expansion is now about 90 percent complete and is expected to open to commercial traffic in April 2016 — nearly two years behind schedule. MANAGUA, Nicaragua (AP) — An environmental study has concluded a planned $50 billion canal across this Central American nation is "viable," officials said Monday, but without releasing details of the report. Canal Commission spokesman Telemaco Talavera said the next step is to submit the findings to an analysis conducted jointly with the Environment Ministry. He said the proposed 172-mile (278-kilometer) route for the canal has been determined to be the right one. Environmental activists, Nicaraguans who stand to be displaced and President Daniel Ortega's political opponents have criticized the project, including what they say has been a lack of transparency since it was first announced. Crews broke ground on access roads related to the canal in December, but have yet to start digging the waterway itself. Some experts doubt it will ultimately be built due to financial, environmental and social concerns. Xu Changbao of HKND, the Chinese company with the commission to build the canal, said the impact study demonstrates a serious commitment to the project. "We will work together with the Nicaraguan people to realize this 100-year-old dream," Xu said. Grand Canal Authority president Manuel Coronel Kautz said the report prepared by British-based consultant Environmental Resources Management was delivered Sunday.